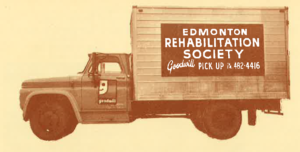 Edmonton Physically Handicapped Association formed and registered as a nonprofit organization; its mandate: social visits and entertainment. Board President Dr. R. Henderson introduced the donated goods concept and visited several USA Goodwills (first recorded contact with Goodwill Industries of America). Alberta Tartan designed and woven at the Centre; approved and adopted by the Alberta Legislature. First Goodwill Store opens in Edmonton. Edmonton Tartan designed, registered with Consumer & Corporate Affairs, Canada. Three year accreditation by Commission on Accreditation of Rehabilitation Facilities (GARF). Administration and Community Training Centre moved to 51 st. Avenue in Edmonton. Kensington and downtown stores successfully converted to Community Training Centres. Power of Work" program scheduled to serve 150 in first 12-month period. Fifth consecutive CARF three year accreditation. 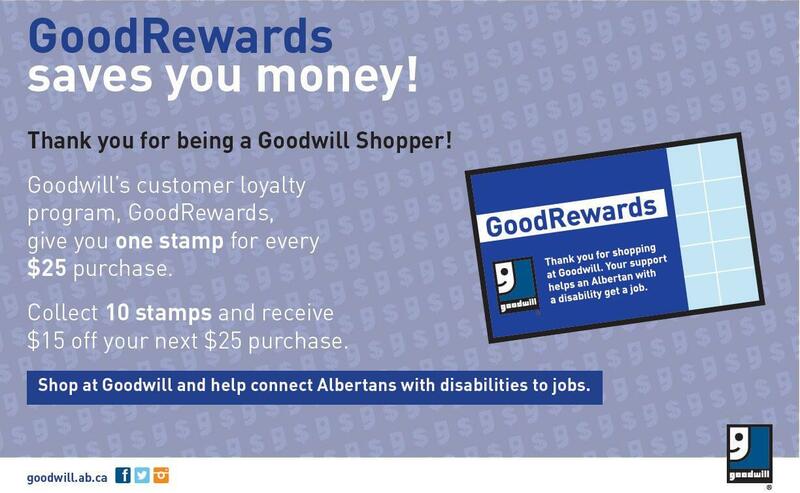 Name change of Goodwill Rehabilitation Services of Alberta to Goodwill Industries of Alberta in June. 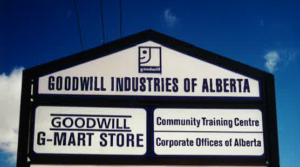 Goodwill Industries of Alberta celebrates 50th Anniversary. 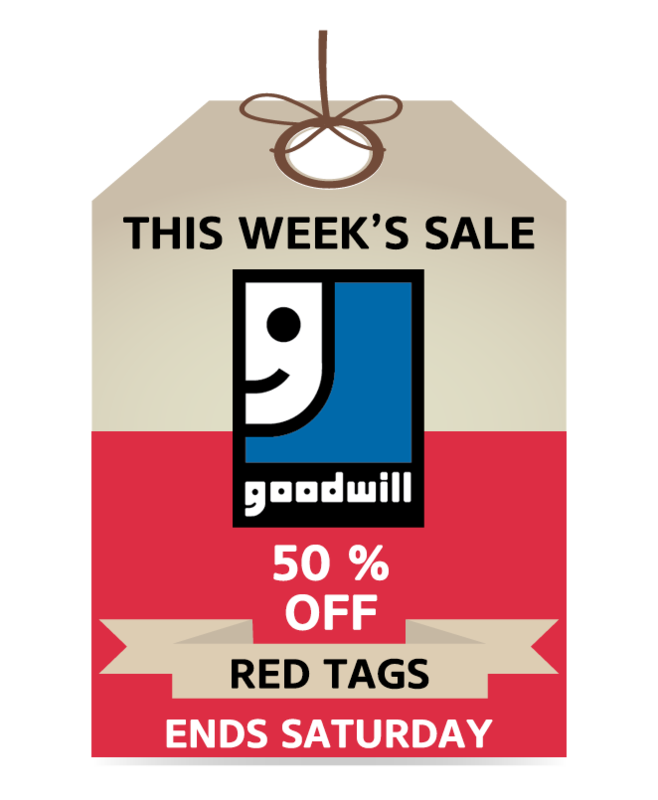 Goodwill opened three stores in Calgary and launched the Training Centre in Grande Prairie. Goodwill opened 12 Goodwill Good Neighbour Centres or Attended Donation Centres. The results of these centres was not only an increase in donations but also jobs for 200 Albertans with disabilities and barriers to employment. 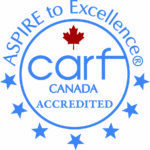 Our agency was awarded the ninth consecutive three year CARF Accreditation. Persons served by Goodwill volunteered 15,290 hours to their communities. 14,800,000 pounds of household goods were diverted from landfill. 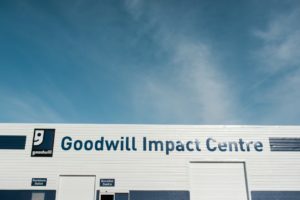 Goodwill opens its first Impact Centre in Edmonton. The 100,000 sq. ft. facility is the first of its kind in Canada. It is home to an outlet store where everything is sold by the pound, a community engagement space, our Commercial Services division, furniture outlet, donation centre and, a warehouse and centralized recycling area.